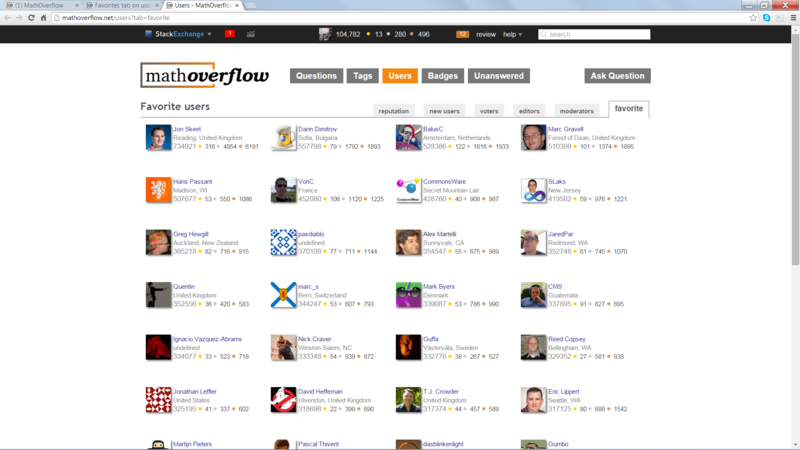 I noticed that the favorite users tab on the main user page is filled with people from StackOverflow, rather than MathOverflow. It is also the same on the math.SE favorite users tab. Is this the first step of the programmer's plan to take over the world? I guess, first, they become the favorite popular clique on all stackexchange sites, and then....? Or perhaps this is a Winter Bash thing? I've now disabled this extension---the tab is now gone---and I apologize for the distraction. Not the answer you're looking for? Browse other questions tagged support user-interface stackexchange .